If there’s anything I’ve made apparent over my time writing video game reviews, it’s that I’m kind of terrible at sports, both physical and digital. While I can hold my own on the more classic systems such as the NES, modern sports games not so much. It’s been a while since I’ve touched any Madden game, so when I got offered the opportunity to check out Mutant Football League: Dynasty Edition for the PlayStation 4, I figured if I can’t manage a team to victory, maybe I’ll do better actually controlling one myself. Given that Mutant Football League isn’t your typical game of football I have quite the uphill battle ahead of me, so let’s dive in. Mutant Football League is the spiritual successor to Mutant League Football, a game that came out on the Sega Genesis back in 1993, while the current incarnation was released for the PC in October of last year with the PS4 and Xbox One versions launching back in January and the Switch version launching last month. The version I’ll be looking at today is the physical version of the PS4 release that also comes with the all of the DLC as well as exclusive teams and arenas, titled Mutant Football League: Dynasty Edition. For those who haven’t played in the MFL before, it works like your typical NFL game…at first. In fact, while it’s been a while since I’ve even touched a Madden or NCAA football game, the core of the gameplay in Mutant Football League reminded me of how those two series worked, right down to how to select and run plays. You still have a lot of play options on offense, defense, and special teams, you still have four quarters (though some changeable options are a bit different than in other games), and you have four downs to either score or get a first down. In fact, with the team and player names in the game, it does feel like a horror-themed Madden game. However, that’s where the similarities end. 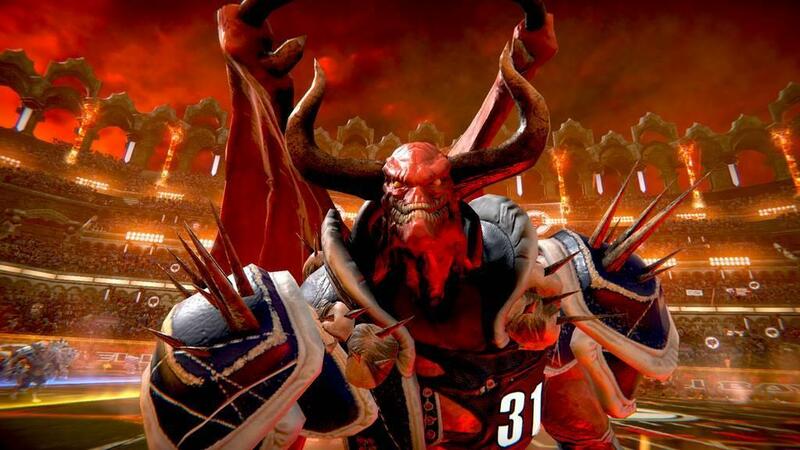 Before getting into what makes Mutant Football League unique, there are several game modes you can play, including Exhibition, Season (play a thirteen game season and try to win the Mayhem Bowl), Playoff (a three-game mini-season where you basically just go through the playoffs), Dynasty (start a team from scratch and lead them to the top), and Online. Unfortunately I was unable to check out the online mode in its entirety as I don’t have PlayStation Plus, but when first choosing the option you can choose a random matchup or play with friends. Choosing the former will start searching for a match while the latter will create a room for you to invite your friends, but if you don’t have PS Plus, that’s as far as you’ll get. 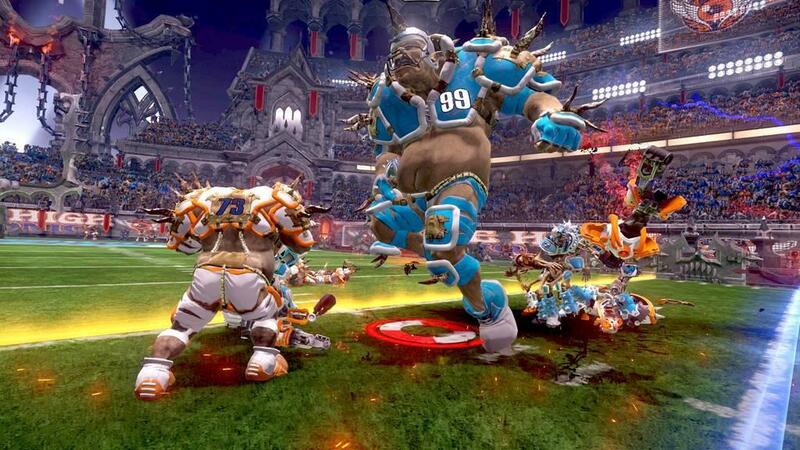 While Mutant Football League may seem like a normal game of football, the rest of the game is anything but, so to speak. For starters, the fields can have hazards like pits of acid and land mines that will blow you up and kill you…yes, your players can actually die if the option is turned on. Each player has a health meter and depending on what happens on the field they’ll take damage. This can be either from certain hazards or just getting hit and tossed around during, or even after, a play. If a player takes too much damage, he dies and you’ll have to replace him. When doing an exhibition game there is an option you can toggle that will automatically revive dead players. Otherwise…well, let’s just hope you’re not too careless with those field hazards. Some of them will not only kill you, but cause you to fumble the ball which, in some cases, may be the worse of the two outcomes. Another mechanic in the game is Dirty Tricks. Each team has a few dirty tricks they can use and a couple that are common among all teams such as Bribe Ref and Attack Ref. For instance, if your opponent is about to score, you can bribe the ref as your play selection (once per half) and he’ll likely enforce some sort of stupid penalty such as handling the ball with too much care. If you wish you can attack the ref, usually after the other team bribed them and cost you some points or a huge amount of yardage. You will be penalized by the new ref (I mean, you probably killed the last one, right? ), but the revenge will be worth it. Other dirty tricks include zapping an opponent with lightning when they have the ball, growing in size a bit and going on a rampage, and a lot more. This is something that I’m kind of on the fence about. Don’t get me wrong, dirty tricks can be fun to mess around with and to have the opponent use to mess with you. Plus you can turn them off in most situations, but there is one particular reason I’ll get to in a moment as to why I’m on the fence about them. While you have the normal exhibition and season modes as well as online play, the main draw of the game is Dynasty Mode. As with other football games, your goal here is to take a team from the bottom of the heap all the way to the top season after season. The catch though is that you're taking one of the game's preset teams and having their stats dropped to around an average of 45 instead of drafting your own team. At the start you’ll choose a couple of options including the difficulty, but once you choose your difficulty, you can’t change it. Before the first season begins you’ll be welcomed as the new manager of whichever team you choose and will be given a goal, such as competing in the Mayhem Bowl (this game’s version of the Super Bowl) by your third season. You’re also given seasonal objectives, bonus objectives (such as winning a certain number of games and maintaining a certain budget), and fail objectives, such as going negative with your budget. Between games you can scout other teams as well as manage a few things with your own. Dead players can be resurrected for a fee and players can earn XP during games depending on their performance which you can spend to level them up and improve them. However, you can only upgrade someone so much each game. Granted you can also go with some free agents if you'd like which, given how low your teams' stats are at the beginning might be the better option and worth the money. The games themselves don’t really change but you can do some practice before each game to work on areas that need improvement. Unless you’re really good at the game, your first season might not go very well as your team’s rating is pretty poor and definitely worse than every other team, sometimes by a pretty good amount. However, I figured I’d go in with the difficulty set on Rookie, the second easiest setting next to Newbie. Even then, between my exhibition game and playing in Dynasty Mode, I learned that even on Rookie the game doesn’t take it too easy on you. I had a lot of instances where no matter what play I ran, I either got stuffed rather quickly or had a pass intercepted. Now granted, a lot of that is on me. As stated, I have the tendency to run a team into the ground…literally in this game, but I figured on Rookie difficulty I’d still stand a bit of a better chance. I stated earlier that I was on the fence with the Dirty Tricks mechanic. Don’t get me wrong, I understand why it’s in the game: it makes this game stand out from others and adds its own identity to the standard game of football. However, for someone like me who isn’t necessarily that great at football to begin with, making a great play only to have it called back because the opposing team just happened to Bribe The Ref that play is kind of disheartening. Luckily you can turn off a lot of these options…for the most part. 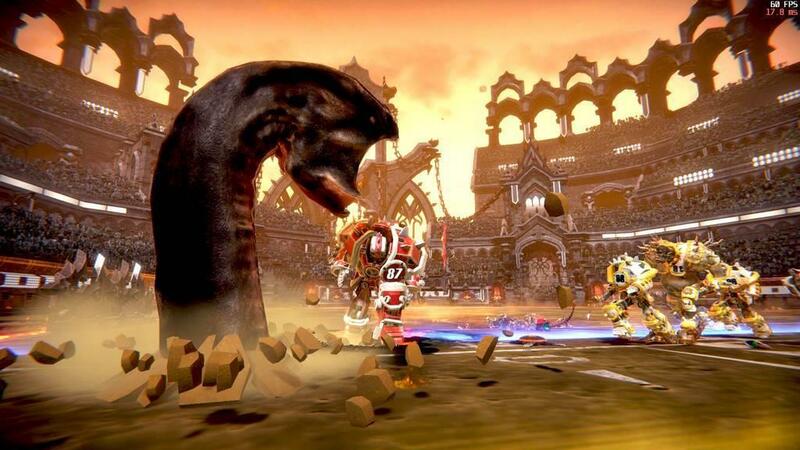 In most of the game modes you can turn off things such as permanent deaths, field hazards, and even the Dirty Tricks, basically turning the game into your typical game of football. However, you CAN’T do that in Dynasty Mode. In fact, when starting Dynasty Mode you can only choose the game speed, quarter length, carnage level, and difficulty level, and once chosen you can’t change them. Sadly that means if you’re not a fan of the Dirty Tricks, then you’ll probably find Dynasty Mode a bit frustrating after the first couple of games. 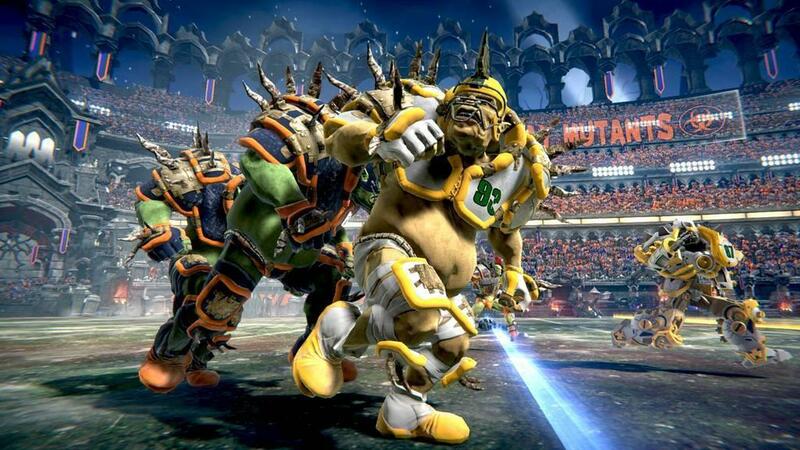 Overall, Mutant Football League is enjoyable depending on how much extra you want in your game of football. If you strip out everything that makes the game unique, it’s an entertaining take on the sport. Even some of the uniqueness is enjoyable. As much as I’m not a fan of the Dirty Tricks, I don’t mind the field hazards. Sure it’s a pain to get blown up by a land mine that you didn’t see because it’s raining acid and you fumble the ball because of it and a sure touchdown turns into a pick six, but that kind of thing is on the field clear as day (so to speak) and it’s your fault if you get blown up by them. The Dirty Tricks can come out of nowhere and even though they’re limited in their use per game, it’s still annoying when you’re finally about to score the go-ahead touchdown or field goal only to have the opponent zap you with lightning and you die. Thankfully though you can turn them off in exhibition, season, or the Playoff game modes. 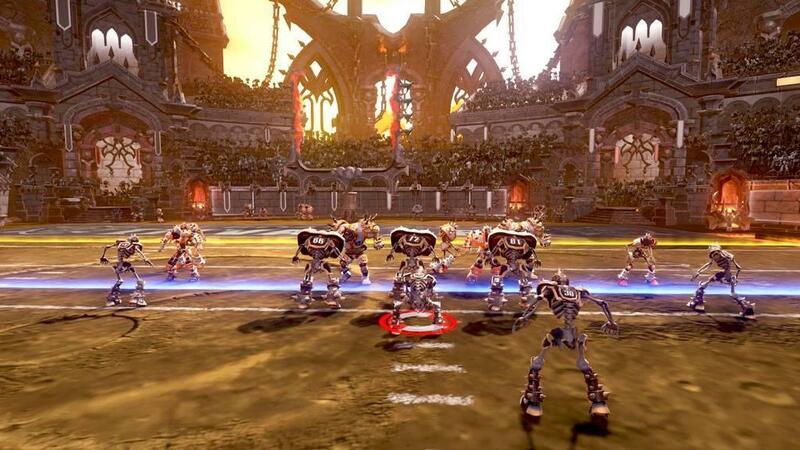 If you like a lot of mayhem with your football, Mutant Football League is worth some play time. Just be prepared for all of the dirty tricks you’ll be forced to contend with in Dynasty Mode. 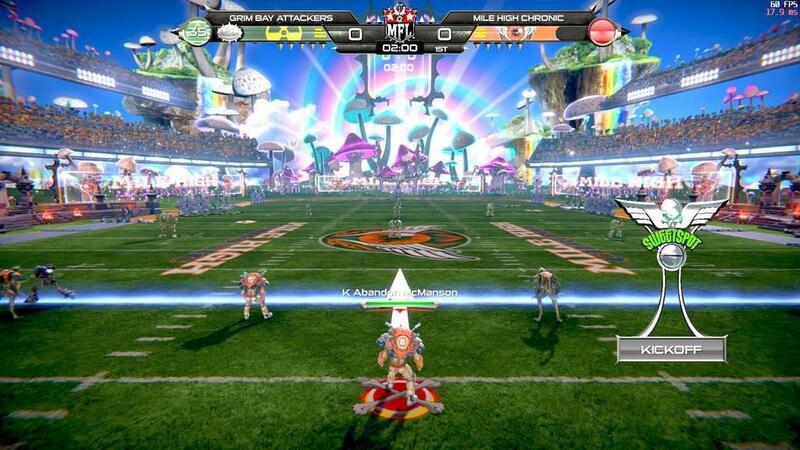 Mutant Football League isn’t your ordinary game of football. Player deaths, field hazards, and dirty tricks make this a unique game from others that take place on the gridiron. 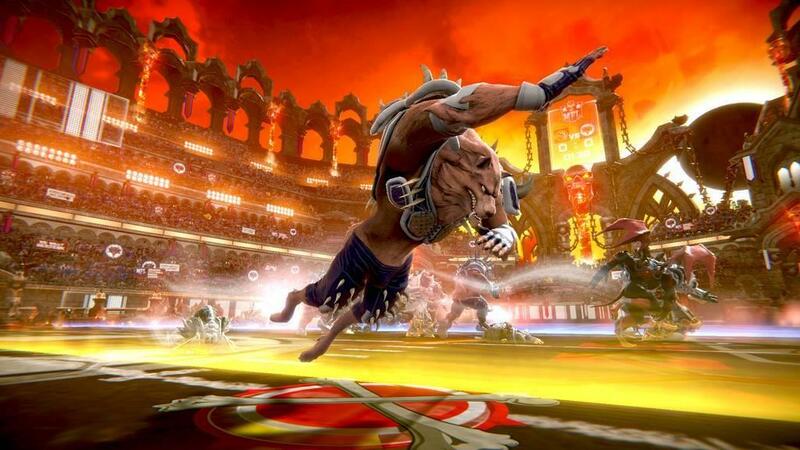 If you’re not a fan of the Dirty Tricks mechanic or are okay with your team being preset instead of drated, then you might not enjoy Dynasty Mode as much, but with Exhibition, Season, and Playoff modes playable without them or several other options, Mutant Football League is still an entertaining game on its own.